Pirates in an Absa Premiership match. Orlando Pirates fought of a spirited Maritzburg United to register a 2-1 league win at a wet Orlando Stadium on Saturday night. Thabiso Kutumela and Happy Jele put Bucs 2-0 up before Siyanda Zulu pulled one back as United made the hosts sweat for victory. The Team of Choice played some incisive football early on but weren’t able to create any clear chances. Instead the Buccaneers took the lead on 30 minutes through Kutumela’s sweetly-struck free kick. Ofori then did well to tip Kutumela shot over the bar shortly afterwards to keep the defecit at one. But the Soweto team extended their lead two minutes after half time when Jele powered a header in from a Memela corner. The Team of Choice reacted positively and had chances as Bandile Shandu fired a 25-yard drive against the upright before William Twala hit a shot into the side-netting. Bucs stopper Jackson Mabokgwane also had to tip Mxolisi Kunene’s free kick onto the post before Xulu thumped in a header from Deolin Mekoa’s delightful free-kick 17 minutes from time. 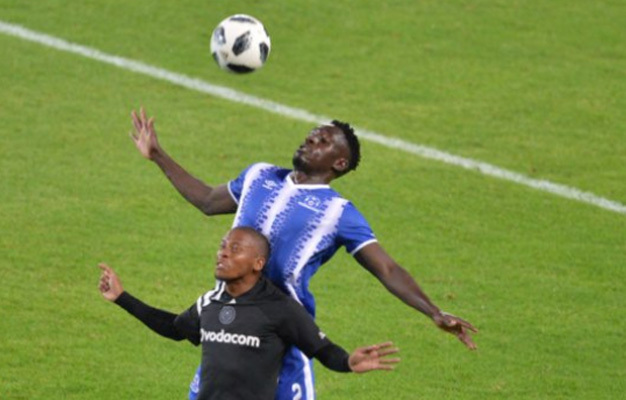 Maritzburg kept Pirates under constant pressure late on and nearly struck an added time equaliser when Mekoa hammered a shot into the upright. Pirates: Mabokgwane, Shitolo, Nyuaza, Jele, Dube, Maela, Munetsi, Nyatama, Memela, Kutumela, Shonga. Subs: Mpontshane, Maphanga, Mlambo, Morrison, Lorch, Foster, Gabuza. Maritzburg: Ofori, Xulu, Fransman, Onyango, Makaringe, Maboe, Ndlovu, Mekoa, Fillecia, Shandu, Mokate. Subs: Mpandle, Matima, De Reuck, Atouba, Kunene, Ntshangase, Twala.